BIRATNAGAR, July 2: The government is preparing to open custom hiring center in all seven provinces of the country to promote farm mechanization among small farmers. According to Yubak Dhoj GC, secretary of the Ministry of Agriculture, Land Management and Cooperatives, the government decided to open farm equipment rental service with the objective of reducing cost of production of farmers, encourage youth toward farming and encourage use of farming equipment. Under the scheme, the ministry will import farming equipment and provide such machineries to all rural municipalities and municipalities via custom hiring centers. Such machineries will be operated by the cooperatives or private sector in local units. “Use of such equipment will make farming easier and reduce time taken for cultivation and harvesting,” added GC. Although the government has targeted to double agro production within five years, GC said that it will be difficult to achieve the target if modern farming technology is not adopted. “Increasing fragmentation of farm land, high cost of production but low yields, and decreasing interest of youth toward farming can affect the government's target of doubling agro production in five years,” he added. Farmers have stopped bringing farming equipment themselves after the government made letter of credit (LC) mandatory for imports. The government levies only 1 percent duty on imports of farm equipment made by farmers. However, it charges 38-40 percent customs duty if such equipment are imported by traders. “Though the government has provided subsidy on import of farming equipment for farmers, there are some barriers which are putting them off,” GC said, adding, “This is why came up with the concept of renting out equipment. According to GC, the success of this scheme hinges on local units and the farmers. 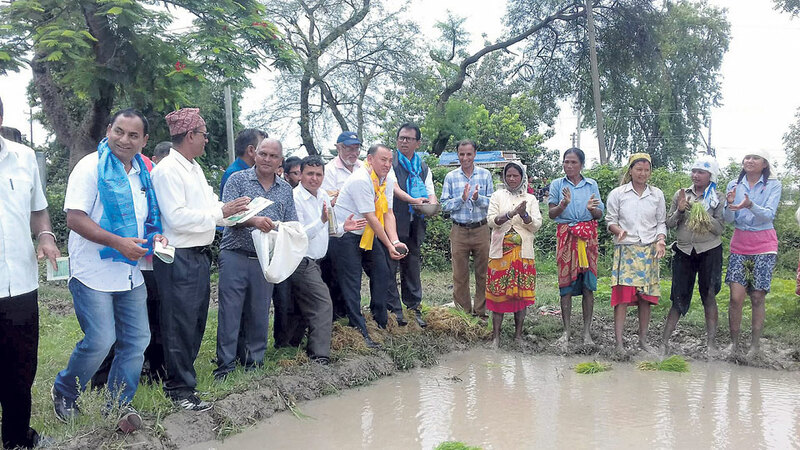 Inaugurating the use of bio-fertilizer at a seed production farm of National Seed Company Ltd at Jhumka of Sunsari, GC said that though compost and bio-fertilizer may look expensive in the beginning its price will go down eventually. “Since organic fertilizers keep sand fertile for long period of time, use of chemical fertilizers can be reduced gradually. That is why we should focus on production and use of organic fertilizers,” GC added.